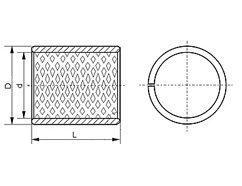 Slide bushes – part of the all-in-one bush bearing. These slide bushes are mounted with tightness into the block part. Usually are mounted with bolts. Slide bushes are made from antifriction materials: bronze, iron, plastic or graphite. Iron slide bushes usually are covered with thin antifriction material layer. Slide bushes can even be made from self-lubricating blistered metal ceramics material. They are various equipment parts. They contain holes in which are positioned other elements of the equipment. 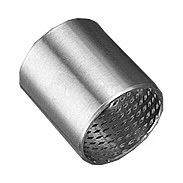 Slide bushes can be tapered or cylindrical shape. They are also divided into: affix bushes, bearing bushes and transition bushes. You can search by the code fragment, or bushes diameter, then you will be provided with all possible options. Enter bushes code, or code fragment. Enter bushes diameter , or part of its diameter.